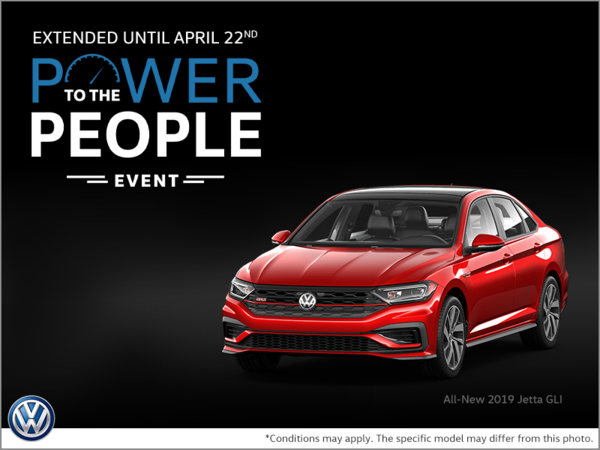 Get the All-New 2019 Jetta GLI during the Power to the people event! Get a 1% rate reduction for current VW customers only, others are eligible for up to 0.5% rate reduction. OR up to $2,500 bonus cash on any 2019 Jetta or Jetta GLI model! Extended until April 22nd, 2019. Certain conditions apply. Book your test drive now! 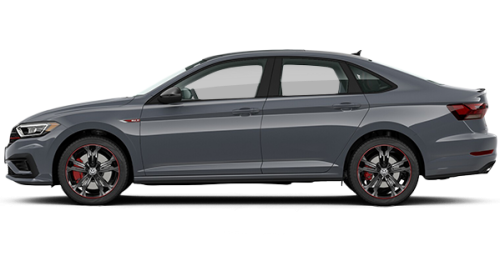 *Available on finance or lease (through Volkswagen Finance, on approved credit) of new, unregistered 2019 Jetta models. For current VW customers or immediate family members living within the same household and on approved credit. Proof of current ownership required. Others are eligible for up to 0.5% rate reduction. In both cases, reduction is off base April Special Rate or Subvented Rate which varies by term length. Example: with reduced finance rate, APR is 0.00% for 60 months with 1% reduction or 0.49% for 60 months with 0.5% reduction. With reduced lease rate, Implicit Lease Rate is 0.49% for 48 months with 1% reduction or 0.99% for 48 months with 0.5% reduction. Implicit Lease Rate not applicable in Quebec. Final APR or Implicit Lease Rate will not be less than 0.0%. **$2,500 cash bonus available to be applied as a discount off MSRP on cash purchase only of new, unregistered 2019 Jetta models. Rate reduction and cash bonus offers end April 22, 2019 and are subject to the change or cancellation without notice. Please see VW dealer for details. “Jetta”, “Volkswagen” and the Volkswagen logo are registered trademarks of Volkswagen AG. © 2019 Volkswagen Canada.